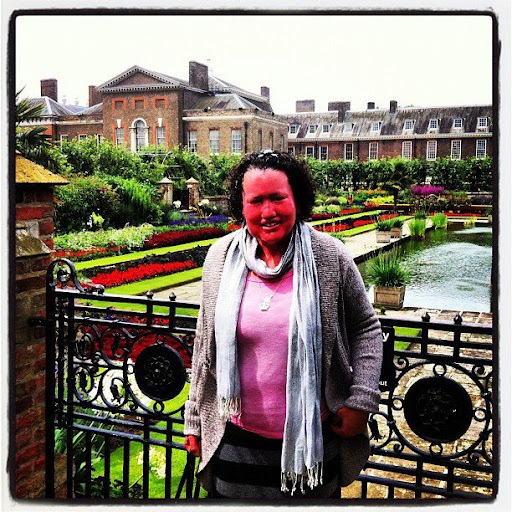 Tune into Radio Carly: Travel tales: Kensington Gardens, Princess Diana Memorial, the squirrel. 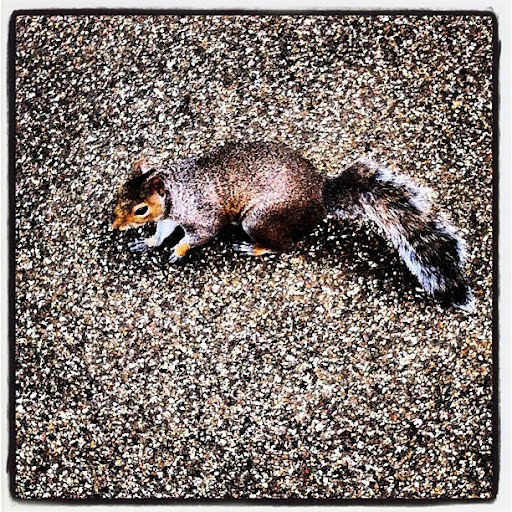 Travel tales: Kensington Gardens, Princess Diana Memorial, the squirrel. Yesterday I took a leisurely walk through Kensington Gardens. I walked pretty much forever. It is so huge - and it is hard to tell where Kensington Gardens end and Hyde Park begins. And it feels like it is worlds away from the city - with luscious green grounds, a lake, lots of beautiful flowers, a fountain, some statues and some wildlife. The Kensington Palace is located in the gardens - I did not go inside yesterday but tomorrow I will tour it with my Aunty. There is also a couple of cafes and restaurants, and the obligatory gift shop. I thought the garden and palace was beautiful. Just after this picture was taken, a squirrel came to greet us. It came so close - I was able to take more than just one photo - and it even sniffed another tourist's hand very closely. I wore a maxi skirt so while I was excited to see it, I also feared it would run up the length of my skirt. The squirrel spent a few minutes running along the garden railing before scurrrying off into the greenery. The walk to the Princess Diana Memorial fountain was a long one. It did feel like one of those "are we there yet?" moments because the paths took many turns. It was not unpleasant though - the gardens are very relaxing. I walked along path after path, passing runners, cyclists, playful dogs and groups of school children playing games. I also saw some tree lopping and lawn mowing happening - the gardens are very well maintained. They are probably not the best for people with allergies, as even after a Zyrtec, I was sneezy from the grass clippings. 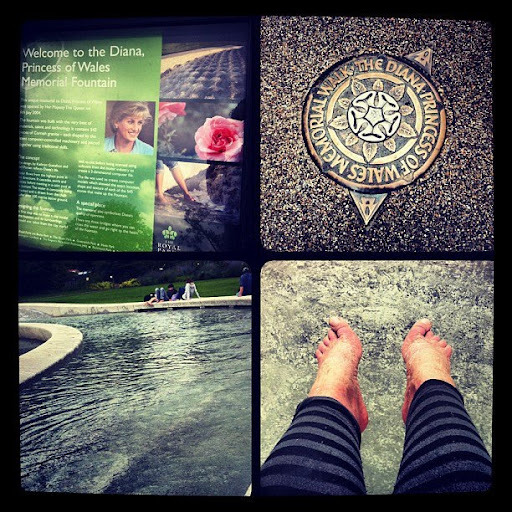 The Princess Diana Memorial Walk made up part of my journey - this walk crosses a number of parks including Hyde Park, St James Park, Green Park and Kensington Gardens, amd it stretches for more than seven miles. Read more about the Walk here. I finally arrived at the fountain, which I think may well be in Hyde Park. It is a low fountain, flowing like a river. The sculpting and flow of the fountain represents Diana's openness and calmness. More information can be found here. At the base of the sign (pictured above) there was a lone bunch of yellow roses, left by a mourner, almost 15 years on. As I read the sign, amd saw the roses, I felt nostalgic, remembering where I was when Diana died - in my room, doing homework and listening to the top 40 countdown, right after my then best friend's 16th birthday party. I thought about Candle in the Wind and reflected on how popular Diana was, and how the media hounded her until the end. I wondered what she'd be doing now. While it was not a very hot day, it was warm for London and there were people lying on the grass with their shirts off, toddlers splashing in swimsuits, and others sitting with their feet in the fountain. I took my socks off and dipped my feet in - the water was deliciously icy as it lapped at my feet. When I was refreshed, I walked along the road skirting Hyde Park and saw an Olympic Village being set up. Though there is only eight days to go, there is still so much set-up going on. 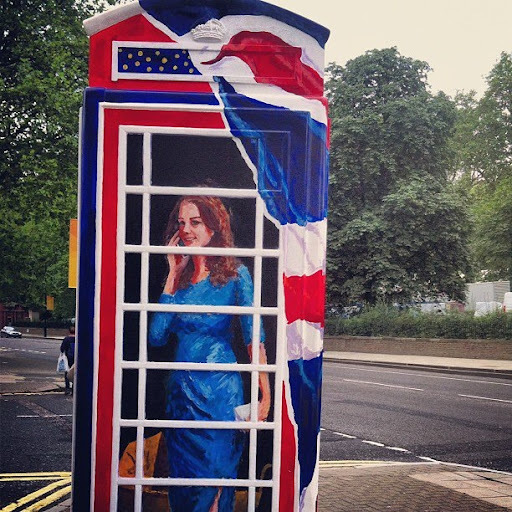 I passed Royal Albert Hall - so majestic - and also some more telephone box art. This is called "Being a Royal" - and on the other side of the box was a playful Prince Harry. Who might I say has not discovered my presence in England yet. Harry, if you are reading this, I am here for four more days and I am staying in Earls Court. A date would be nice. Aww the squirrel is so cute! I remember when I was living there, one day I took a trip to Hyde Park and ended up following a squirrel all over the place! He was beckoning me, I tells you! LOVE that Royal phone box! It's fantastic. That last photo just made me start humming Jimmy Little's song Royal Telephone! I had no idea that the walk to the Princess Diana Memorial was so epic. Sounds lovely though!